Indulge yourself with Torani's Classic syrup line. Choose from a huge variety of unique flavors -- from almond to mojito mint to tangerine to white chocolate! 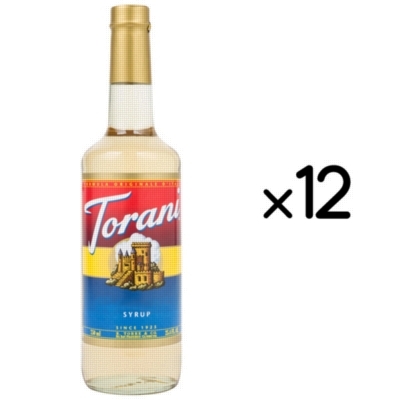 Torani makes your coffee-based drinks, smoothies, or Italian sodas extra flavorful. Torani inspires you to taste life, one flavorful experience at a time. Assorted case features 12 different 750 ml glass bottles. Save even more per bottle! NOTE: The following tart fruit flavors can be used in dairy-based drinks without causing curdling: Blue Raspberry, Red Raspberry, and Orange. Select your assorted flavors below. INGREDIENTS: Pure cane sugar, water, natural flavors, citric acid, sodium benzoate and potassium sorbate (to preserve freshness). INGREDIENTS: Pure cane sugar, water, natural flavors, sodium benzoate and potassium sorbate (to preserve freshness), citric acid. Contains dairy allergens. INGREDIENTS: Pure cane sugar, water, natural flavors, citric acid, sodium benzoate (to preserve freshness), caramel color. INGREDIENTS: Pure cane sugar, water, natural flavors, citric acid, sodium benzoate (to preserve freshness), FD&C red #40, caramel color. INGREDIENTS: Pure cane sugar, water, natural flavors, citric acid, caramel color, sodium benzoate (to preserve freshness), FD&C red #40. INGREDIENTS: Pure Cane Sugar, water, natural flavors, citric acid, sodium benzoate (to preserve freshness), FD&C blue #1. INGREDIENTS: Pure cane sugar, water, natural flavors, sodium benzoate and potassium sorbate (to preserve freshness), and FD&C Blue #1. INGREDIENTS: Pure cane sugar, water, natural flavors, citric acid, potassium sorbate and sodium benzoate (to preserve freshness), FD&C red #40, FD&C blue #1. INGREDIENTS: Pure cane sugar, water, natural flavors, citric acid, sodium benzoate (to preserve freshness), potassium sorbate (to preserve freshness), caramel color. INGREDIENTS: Pure cane sugar, water, natural flavors, potassium sorbate, sodium benzoate (to preserve freshness), citric acid, caramel color. INGREDIENTS: Pure cane sugar, water, natural flavors, sodium benzoate, potassium sorbate, (to preserve freshness), citric acid, caramel color. INGREDIENTS: Pure cane sugar, water, natural flavors, citric acid, sodium benzoate, potassium sorbate (to preserve freshness), caramel color. INGREDIENTS: Pure cane sugar, water, natural flavors, citric acid, sodium benzoate (to preserve freshness), potassium sorbate (to preserve freshness). INGREDIENTS: Pure cane sugar, water, natural flavors, caramel color, citric acid, sodium benzoate and potassium sorbate (to preserve freshness). INGREDIENTS: Pure cane sugar, water, natural flavors, sodium benzoate and potassium sorbate (to preserve freshness), caramel color, citric acid. INGREDIENTS: Pure cane sugar, pure cocoa extract, natural flavors, sodium benzoate (to preserve freshness), caramel color. INGREDIENTS: Pure cane sugar, water, natural flavors, sodium benzoate (to preserve freshness), citric acid, caramel color. INGREDIENTS: Pure cane sugar, water, natural flavors, citric acid, sodium benzoate, potassium sorbate (to preserve freshness). INGREDIENTS: Pure cane sugar, pure cacao extract, natural flavors, caramel color, citric acid, sodium benzoate and potassium sorbate (to preserve freshness). INGREDIENTS: Pure cane sugar, water, natural flavors, citric acid, sodium benzoate (to preserve freshness), caramel color, potassium sorbate (to preserve freshness). INGREDIENTS: Pure cane sugar, water, natural flavors, salt, citric acid, sodium benzoate (to preserve freshness), caramel color. INGREDIENTS: Pure Cane Sugar, water, natural flavors, citric acid, sodium benzoate (to preserve freshness), FD&C red #40. Contains hazelnut and milk allergens. INGREDIENTS: Pure cane sugar, water, natural flavors, citric acid, sodium benzoate and potassium sorbate (to preserve freshness), caramel color. INGREDIENTS: Pure cane sugar, water, natural flavors, citric acid, sodium benzoate (to preserve freshness), FD&C red #40, FD&C blue #1. INGREDIENTS: Pure cane sugar, water, natural flavors, fractionated coconut oil, ester gum, citric acid, sodium benzoate and potassium sorbate (to preserve freshness), FD&C yellow #5, FD&C yellow #6, caramel color. INGREDIENTS: Pure cane sugar, water, natural flavors, citric acid, tartaric acid, sodium benzoate (to preserve freshness), FD&C yellow #5, caramel color. INGREDIENTS: Pure cane sugar, water, natural flavors, citric acid, tartaric acid, sodium benzoate (to preserve freshness), FD&C yellow #5, FD&C blue #1. INGREDIENTS: Pure cane sugar, water, natural flavor, citric acid, sodium benzoate (to preserve freshness), caramel color. INGREDIENTS: Pure cane sugar, water, natural flavors, salt, sodium benzoate (to preserve freshness), citric acid, potassium sorbate (to preserve freshness). INGREDIENTS: Pure cane sugar, water, natural flavors, citric acid, sodium benzoate, potassium sorbate, (to preserve freshness). INGREDIENTS: Pure cane sugar, water, natural flavors, citric acid, sodium benzoate (to preserve freshness). INGREDIENTS: Pure cane sugar, water, natural flavors, citric acid, sodium benzoate (to preserve freshness), malic acid, FD&C yellow #5, FD&C yellow #6. INGREDIENTS: Pure cane sugar, water, natural flavors, sodium benzoate and potassium sorbate (to preserve freshness), citric acid. INGREDIENTS: Pure cane sugar, water, natural flavors, caramelized sugar syrup, sodium benzoate (to preserve freshness), citric acid, salt. INGREDIENTS: Pure cane sugar, water, natural flavors, tartaric acid, sodium benzoate (to preserve freshness), caramel color, FD&C Red #40. INGREDIENTS: Pure cane sugar, water, natural flavors, sodium benzoate (to preserve freshness), citric acid, potassium sorbate (to preserve freshness), caramel color. Contains dairy allergens. INGREDIENTS: Pure cane sugar.water, natural flavors, citric acid, sodium benzoate and potassium sorbate, carmel color. INGREDIENTS: Pure cane sugar, water, natural flavors, citric acid, sodium benzoate (to preserve freshness), caramel color, FD&C red #40. INGREDIENTS: Pure cane sugar, water, natural flavors, sodium benzoate (to preserve freshness), caramel color, potassium sorbate (to preserve freshness), FD&C red #40. INGREDIENTS: Pure cane sugar, water, natural flavors, citric acid, tartaric acid, sodium benzoate (to preserve freshness), FD&C red # 40. INGREDIENTS: Pure cane sugar, water, natural flavors, salt, sodium benzoate and potassium sorbate (tor preserve freshness), citric acid. Contains dairy allergens. INGREDIENTS: Pure cane sugar, water, natural flavors, citric acid, tartaric acid, sodium benzoate (to preserve freshness), FD&C red #40. INGREDIENTS: Pure cane sugar, water, natural flavors, sodium benzoate (to preserve freshness), citric acid, FD&C red #40, FD&C yellow #6. INGREDIENTS: Pure cane sugar, water, natural vanilla flavors, potassium sorbate (to preserve freshness), citric acid, caramel color. INGREDIENTS: Pure cane sugar, water, natural flavors, malic acid, sodium benzoate (to preserve freshness), and FD&C red #40.